DAVIDSON, NC – Wayne Brothers Incorporated has changed their corporate logo to Wayne Brothers Companies. “This change was in an effort to better reflect who we are and where we are going” explains Keith Wayne, President and CEO. “This aligns with our ten-year strategic growth plan”. 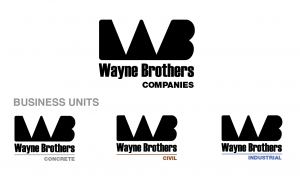 In addition to this change, Wayne Brothers has also branded the three distinct Business Units that operate under the holding company. These three Business Units are: Concrete, Civil, and Industrial. “Each business unit will have its own logo. We branded each Business Unit to better communicate our full scope of offerings within each unit. For example, under our Industrial Business Unit we offer specialty concrete, equipment rigging & installation, and process integration.” states Shannon Sapp, Business Development Manager. InteSpec, Inc, a process integration company acquired by Wayne Brothers in 2018, has officially changed its legal name to Wayne Brothers Process Integration. Wayne Brothers Process Integration will operate under the Wayne Brothers Industrial Business Unit lead by industry veteran, Bobby Phillips. Phillips was recently named Vice President of the Wayne Brothers Industrial Unit; previously serving as the Vice President of Business Development. Phillips has been with Wayne Brothers for over 33 years.